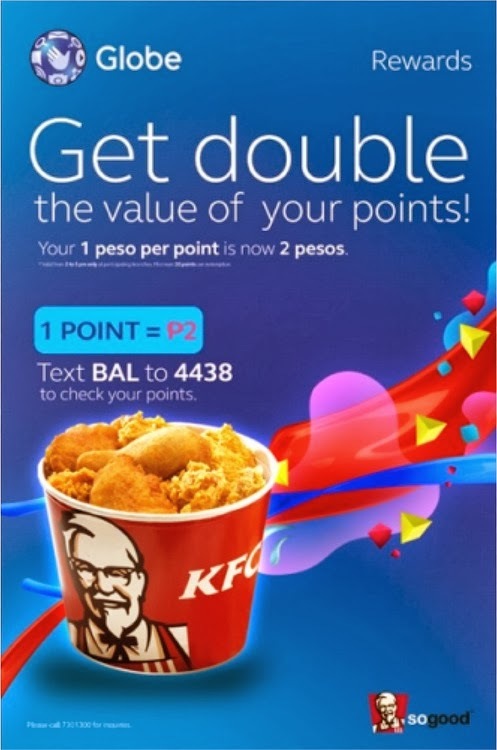 Globe Rewards: Double Your Points Value This Weekend! Fun fact: I've been using Globe for 13 years now (Sheesh. I'm a dinosaur!) and what I love most about them is that they have this rewards system that is easy to track and easy to use. All you have to do is collect points and use them up as needed. If you love Globe's current rewards system, then you will love them even more now because this weekend, Globe subscribers will get to enjoy double the value of their rewards points at participating branches nationwide! That means that 1 point will equal to Php 2 now instead of just Php 1! Booyah! Have you decided which places to dumog yet? If so, all you have to do is visit the branch, get briefed on the promo (you'll basically have to text BAL to 4438) and choose what you want to buy! After that, just text BUY <mobile #> <points> to 4438. Easy peasy! Waaah! Sayang! I failed to notice this yesterday! Sana meron pa ulit!